The MD9200-DEC-OG is an openGear® compatible industry-leading live OTT streaming media decoder. Format support includes Ultra High Definition (UHD) 2160 HEVC1, 1080P AVC, and 1080i MPEG2. 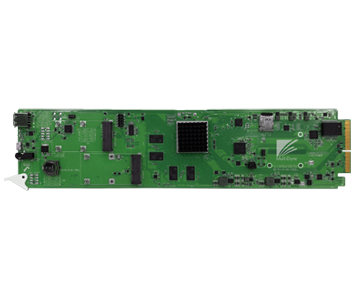 Up to 20 MD9200-DEC-OG cards can be housed in a single 2 RU openGear® 3.0 or X chassis. IP protocol support includes source specific UDP RTP with IGMP v3, SRT, Zixi, RTMP, RTSP, HLS, DASH, TCP with file capture and playback from disk. Network Protocol Translation provides input to putput protocol translation. The MD9200-DEC-OG has two independent Gigabit Ethernet ports. 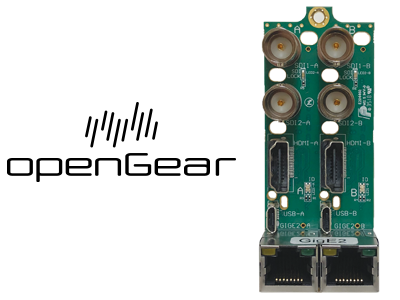 Port 1 is connected via the openGear® frame mid-plane and Port 2 via Rj45 jack on the RM-01 rear module. Network security is a priority at MultiDyne. All MultiDyne devices include the latest network security patches, HTTPS web server plus user options to disable SSH, SAMBA and PING. OpenVPN is included and can be used witout the need for an optional VPN appliance. MultiDyne offers a modestly priced SLA2 providing ongoing patches that include network security updates with new firmware features. The MD9200-DEC-OG is designed for broadcast and professional decoding. The baseband video interfaces include two mirrored 3G HD-SDI outputs via BNC and one HDMI 1.4 output. The MD9200-DEC-OG is optimized to decode 1080P AVC (H264), 1080i MPEG 2 (H.262) with optional support for very high bit-rate 2160P HEVC (H.265) UHD bitstreams. Ancillary data support for closed captions with OSD open captions and SDI embedding, SCTE 35 and KLV logging are standard features. Audio decode support for up to four PIDs or 8-channels3. Audio CODEC support includes MPEG Layer 1/2/3, AAC-LC/HE with optional Dolby Digital decode with passthrough to HDMI and HD-SDI embedding. Managing and monitoring the MD9200-DEC-OG is facilitated via the Web Server, SNMP and REST APIs.